A few years ago, the Little Sisters of St. Therese of the Child Jesus, in Kiirua, Kenya grew what crops they could on a small portion of their 23-acre field. Today they’re growing an agribusiness that measures its yields in tons. The sisters have worked in Kiirua since 1967. They provide health services, a feeding program for children under 6 and an early childhood development center. Until recently, they were reliant on donors to cover costs of the services they wished to provide and often this was not sufficient. Malnutrition was not uncommon. Children often survived on very limited diets. During this time the sisters struggled to farm Vince Farm, their 23-acres of land overlooking the internationally renowned Lewa Conservancy. Most of the land lay uncultivated. Sister Mary Agnes, the congregations’ superior, said that the land looked fertile but the sisters had little knowledge and few farm management skills. Water, too, was scarce and drier months grew longer and rains more erratic. Then they teamed with Catholic Relief Services in a Conrad N. Hilton Foundation-funded project called Strengthening Capacities of Women Religious in Early Childhood Development (SCORE-ECD). 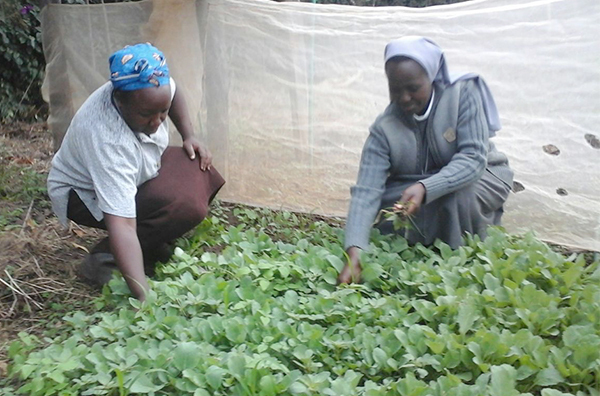 Sr. Esther and caregivers apply agronomy practices on the congregation's farm in Kenya. In addition to its direct focus on improving Early Childhood Development services, the project strengthens the organizational capacities of religious organizations through trainings, mentorships and accompaniment to increase the sustainability of their programming. To do that, the sisters and CRS staff reached out to another CRS program: Farmer to Farmer. Funded by U.S. Agency for International Development, Farmer to Farmer matches US volunteers skilled in agriculture and related fields to small-scale farmers and entrepreneurs who need specific expertise. Together the project identified experts and invited them to share their skills and experience. “It was exactly what we needed” says Veronica Muthoni, the farm manager. The technical experts trained the sisters and some of the children’s caregivers on farm planning, crop and livestock management, land preparation, seed production and irrigation regulation. Their farm went far beyond supplying their feeding program’s and a local hospital’s legume, cereals, vegetable and fruit needs. They’re now able to reach larger markets in Nairobi and other Kenyan towns with their surplus. In a collaboration with export companies they sold 10 tons of peas to “Kenya Highlands” to be exported to international markets. They’re in the process of establishing a contract with “Meru Greens” to process and export fruit, a considerable achievement according to Sr. Mary Agnes, the congregation superior. Their level of sophistication means they’re less dependent on weather patterns and improves their market strategy. During the dry seasons, the sisters use irrigation to grow drought resistant crops such as onions, tomatoes and cabbages. “This gives us advantage in the market as these products are in demand in those dry periods,” Veronica says. “It’s been impressive to see how through SCORE-ECD and Farmer to Farmer, sisters have increased income, getting rid of middle men and selling directly to their clients.” said the Farmer to Farmer Kenya program director. The sisters didn’t keep their wealth of knowledge to themselves. In collaboration with the Ministry of Agriculture, Livestock and Fisheries, the Little Sisters of St. Therese of the Child Jesus have trained 216 caregivers in agronomy and dairy farm practices. Veronica said that through the trainings, mothers and care givers of children under two years have acquired improved farming skills which they use in their own gardens to produce nutritious foods for their childrens’ growth and development. Many children no longer need the sisters’ feeding program.